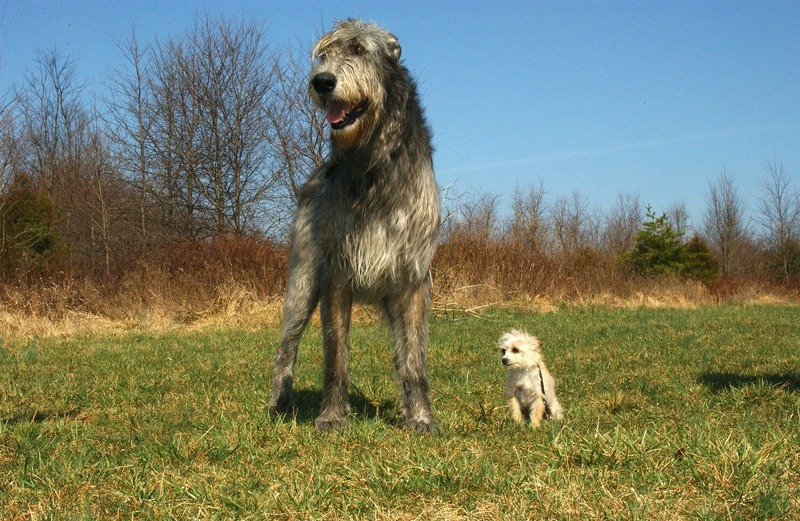 Give them a chance, wolfhounds will eat as much as they can! So keep any dry food in tight containers. It is important to ensure that they are not fed too much as this places strain on their skeleton and heart and can lead to problems in later life. Small, frequent meals are preferable; four times a day for puppies and twice a day for adults is a good guide. A useful test to check for overfeeding is to feel their ribs. Ribs should only have a thin covering of flesh/fat. If the ribs are covered by a substantial amount of flesh/fat (more than a centimeter or so) then you are probably feeding too much. If feeding commercial, dry, food the guidelines on giant breed (puppy and adult) should be adhered to. Breeders tend to have strong views on the appropriate diet for puppies and adults and it is reasonable to expect detailed advice about feeding upon buying a puppy. Wolfhound enthusiasts have strong opinions about the merits of raw versus dry food (for the dog, not the owner). If you intend to feed raw food (BARF or Bones and Raw Food) the following links are useful. Be careful when giving wolfhounds bones. If in doubt, don’t. Small bones that can be crunched into large pieces and swallowed whole that then block the stomach/intestine. Remember that what may be a large bone for most breeds is just a snack for a wolfhound. In modest quantities, large, whole, uncooked, beef knuckles that the wolfhound is obliged to gnaw on are acceptable. Once the bone has been gnawed down significantly it is best to remove it before it is swallowed.